Ready for super flavor? 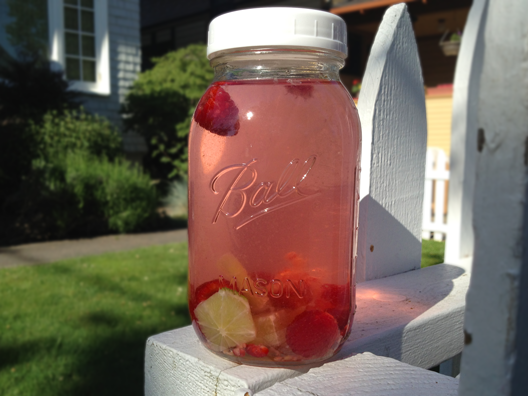 Try this sweet tangy infusion of raspberries and lime! It’s easy, fast, and fresh. And if you leave the water to sit in the fridge overnight, you won’t believe how flavorful and delicious it becomes. Recipe for a 32 ounce Ball jar (pictured with plastic lid): 8-10 raspberries crushed with a wood muddler + a small lime with rind removed. 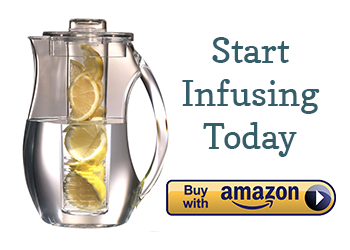 Infuse for 1-12 hours and strain before serving. To muddle the raspberries, simply crush them with your muddler until you see the juice escape. There will be some raspberry pieces in the water as a result of the muddling, so it’s best to strain through mesh strainer before serving. Lastly, it’s important to cut the rind off of the lime for this recipe. Lime rind is quite bitter and can impart an undesirable taste. Enjoy! Can I use frozen fruit ? Also for pineapple is canned alright as long as its packed in its own juices? I took this to work with me a few days ago and loved it! For some reason it tasted very mojito-like to me even though there was no mint. Delicious! I have been trouble finding descent limes lately. Is lime juice just as good?